It’s just before midnight, and as you are about to turn 54 here’s my entry on your facebook page. It’s not quite midnight here in Illinois, so ahead of the hour I want to wish you a happy birthday. Mack is coming home and we’ll all be together just like we were exactly three months ago when you did that really cool thing. (I love you.) Wait till you see the the presents the kids have for you. Next up … a little party for 100 local interested friends + swimmers + family to watch Doug make a killer presentation about A Long Swim. Why anyone would want to swim the English Channel, how to swim the English Channel, what happens after you swim the English Channel, and more. It’s funny and touching and a whole amazing experience wrapped up into one fascinating hour. He’s been making presentations to investment banking firms and rotaries and schools, and I’ve gone along to each one, but this time the audience will be completely filled with people I love. What a night this is going to be. So important that we stayed in last night, on a Saturday night, and went to bed early. It was such an honor that it weighed in a lovingly heavy way on our minds and it was all we could think about. There were ALS patients at the event whose lives have been shattered, and swimming the English Channel paled in comparison to their accomplishments of fighting to live another day. We never had doubts about dedicating this swim to ALS. Today we were extremely proud and we were quite humbled. 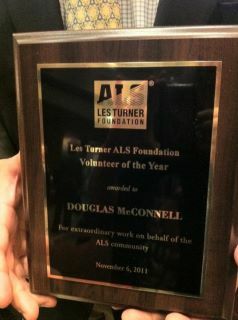 So far, A Long Swim has raised $157,000 for the Les Turner ALS Foundation. No need to stop now. The next swim will be Catalina in July of 2012 and the dedication remains the same.